As we move towards a more connected world with an increase diversity in applications, there is strong demand for heterogeneous computing. Currently, servers are providing dedicated hardware for each specialized workload. In today’s market, the is a lack of a single high performing processor that can do all these complex computation effectively. Huawei is going to change the game with the launch of their new Kunpeng 920 Server CPU. The Huawei Kunpeng 920 is the state of the art CPU that promises unparalleled performance and efficiency against other similar server processors in the market today. It is based on the 7nm lithography node and designed with an ARM architecture. This means that the Kunpeng 920 is expected to be highly power efficient. Moreover, each CPU also comes with 64 cores, 8-channel DDR4 memory, next-generation PCIe 4.0 and a 100Gbps network capabilities. These are the characteristics of a processor that will form the computers of tomorrow. The Kunpeng 920 is designed for server workloads and optimized for data centers. Based on the tests conducted by Huawei labs, the Kunpeng 920 performs 25% better in the SPECint2006 test than current industry benchmark. While CPU computational performance is fundamental to the overall performance of a server, the I/O throughput is equally important as well. To circumvent any bottlenecks in I/O, Huawei has equipped the Kunpeng 920 with the best possible technologies that are available in the industry. This processor comes with the new PCIe 4.0 standard, which doubles the bandwidth of the mainstream PCIe 3.0 interface. The increased supported memory speed and number of channels also resulted in 50% increase in overall memory bandwidth. The CPU also comes with an integrated 100GbE for compromised data transfers over the network and machine to machine communication and distributed computation. Thanks to the 7nm fabrication process and efficient ARM architecture, the Kunpeng 920 will also be one of the most power efficient server class CPUs available on the market. We believe that the release of the Kunpeng 920 will also bring about a change of impression on ARM based ARM based servers. The Kunpeng 920 systems will be available through Huawei’s TaiShan servers. These new servers are designed for various use-cases ranging for conventional workloads to storage. The TaiShan X6000 was also announced for enterprises requiring highly dense compute requirements, as each 2U unit can hold up to 4 nodes (i.e. 256 cores). The compute capabilities of the new Kunpeng 920 can also be rented from Huawei’s Elastic Cloud platform, which are powered by the TaiShan servers. These ARM based servers are also excellent for native cloud phone services as they essentially use the same instruction set as the smartphones. This opens up a new level of cloud based connected mobile computing. It will be interesting on how the world will change with the advancements in technology in this area together with the push towards 5G connectivity. [Shenzhen, China, January 7, 2019] Huawei has announced the industry’s highest-performance Advanced RISC Machine (ARM)-based CPU. Called Kunpeng 920, the new CPU is designed to boost the development of computing in big data, distributed storage, and ARM native application scenarios. Huawei will join with industry players to advance the ARM industry and foster an open, collaborative, and win-win ecosystem, taking computing performance to new heights. “Huawei has continuously innovated in the computing domain in order to create customer value. We believe that, with the advent of the intelligent society, the computing market will see continuous growth in the future. Currently, the diversity of applications and data is driving heterogeneous computing requirements. Huawei has long partnered with Intel to make great achievements. Together we have contributed to the development of the ICT industry. Huawei and Intel will continue our long-term strategic partnerships and continue to innovate together,” said William Xu, Director of the Board and Chief Strategy Marketing Officer of Huawei. Kunpeng 920 is the industry’s highest-performance ARM-based server CPU. Using the cutting-edge 7nm process, the CPU was independently designed by Huawei based on ARMv8 architecture license. It significantly improves processor performance by optimizing branch prediction algorithms, increasing the number of OP units, and improving the memory subsystem architecture. 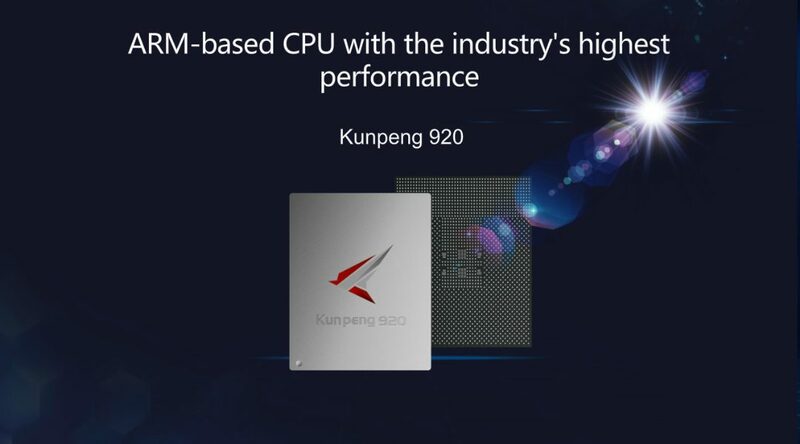 At typical frequency, the SPECint Benchmark of the Kunpeng 920 CPU scores over 930, which is 25% higher than the industry benchmark. At the same time, power efficiency is 30% better than that offered by industry counterparts. Kunpeng 920 provides much higher computing performance for data centers while slashing power consumption. Kunpeng 920 integrates 64 cores at a frequency of 2.6 GHz. This chipset integrates 8-channel DDR4, and memory bandwidth exceeds incumbent offerings by 46%. System integration is also increased significantly through the two 100G RoCE ports. Kunpeng 920 supports PCIe Gen4 and CCIX interfaces, and provides 640 Gbps total bandwidth. In addition, the single-slot speed is twice that of the incumbent offering, effectively improving the performance of storage and various accelerators. Huawei today also released its TaiShan series servers powered by Kunpeng 920, including three models: one with a focus on storage, another on high-density, and a third focused on balancing both requirements. The TaiShan servers are built for big data, distributed storage, and ARM native application scenarios. The ARM architecture is best suited for these scenarios with advantages in many-core and performance per watt. TaiShan will enable computing platforms with high performance and low power consumption for enterprises. For example, in big data scenarios, the TaiShan servers are tuned for optimal many-core high concurrency and resource scheduling to deliver a 20% computing performance boost. Based on the TaiShan servers, Huawei Cloud also provides elastic cloud services, bare metal services, and cloud phone services. Huawei continuously promotes industry cooperation in terms of hardware, basic software, and applications. Huawei has been working with industry organizations such as Green Computing Consortium (GCC), Linaro, and Open Edge and HPC Initiative (OEHI) to build an open, collaborative industry ecosystem, alongside partners such as Hortonworks, Microsoft, Red Hat, SAP, SUSE, Ubuntu, and China Standard Software. On the hardware side, Huawei is a core member of Linaro. On the basic software side, Huawei is a Platinum member of OpenStack and a Founder member of Cloud Native Computing Foundation (CNCF). With regard to applications, Huawei has joined the GCC. GCC has released the Green Computing Consortium Server Technical Standards Report, along with other efforts to build a green open source computing community. Huawei is also a member of the OEHI. Huawei believes that an intelligent society with all things connected, sensing, and intelligent is underway, and this trend is picking up speeds. The development and convergence of ARM-based applications on smart terminals are accelerating, along with cloud-device collaboration. In addition, new applications in cloud computing are driving data diversity. For example, big data applications, distributed storage, and some edge computing scenarios have specific energy efficiency requirements for many-core high-performance computing. In such a context, ARM systems stand out with unique advantages in performance and power consumption. Therefore, in view of the industry trends and application requirements, a new era of diversified computing is unfolding. Multiple data types and scenarios are driving computing architecture optimization. Combining multiple computing architectures for optimal performance becomes a must.